We love what we do, however couples do not understand the cost involved with professional wedding photography. Wedding photography have years of education and training just like any other field. Some study photography for 4 years or even longer. 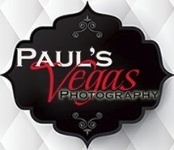 With photographers at Paul’s Vegas Photography education is an ongoing and continuing process. A lot of times couples are only aware of the amount of time the photographer spends at their wedding. The time that is invested in photography is not just what you see when your photographer is pointing the camera at you. The final images do not just appear as a final product without timing, lighting, calibrating, and adjusting. Wedding Photography takes many hours after the images are taken to make a final product. The hours that are spent after the shoot are never taken in to consideration. On the average, a wedding that is 6 hours of photography time takes around 24 hours to complete. Some photographers offer to give raw images right out of the camera. This saves those photographers a lot of labor however the product you would be receiving is not the quality you receive with companies like Paul’s Vegas Photography. Wedding Photography is a specialty within photography. You might have a friend that is a photographer that specializes in babies, children, food, or whatever. When it comes to wedding photography it takes years’ experience including posing classes and lighting to get it right! We shot a first anniversary for a couple and while we were getting prepared for the shoot the bride showed us her wedding images. The images that she showed us came to a total of 25 most of them blurry and out of focus with bad color exposure. The problem with the photos was that the photographer had only shot families and children with natural light. She was not prepared for an indoor wedding and was relying on natural light provided by the venue. Next time your photographer explains why the cost for your Wedding Photography is X understand that we put time effort and care into what we do as a professional.